This is for those few on this forum who makes big cars or for someone who likes engines. https://www.thingiverse.com/thing:3531707 Is there something hidden in the background? Soo, the last week and today I made a couple of gears. Link1: Gears in the sizes 16t, 20t, 24t, 36t and 40t: https://www.thingiverse.com/thing:3480916 Link2: Clutch Gears same to the sizes above: https://www.thingiverse.com/thing:3480895 Link3: Gears in sizes between 17t and 39t except those sizes in Link1: https://www.thingiverse.com/thing:3480921 Link4: Clutch gears in sizes between 17t and 39t except those sizes in Link2: https://www.thingiverse.com/thing:3480907 Here are the video if you dont want to go to thingiverse. Enjoy the 50 different gears or so. Took me a while to make. The brown rims gotta be 3d printed. Like efferman, I think most people prefer SLS printed parts, but I have made a lot of custom Lego for FDM, and I think this is done that way too. I can see a detail which happens on a printer soon to get new belts. Its like a small wave. @Holodoc Thanks. I didnt know how to change size from imgur, but now I do. I hope its better. If you have time. Can you check my own topic if the pics are ok size. I dont know whats best for everyone. This is a cool project. How big wheels are you gonna use? If you want, I could try to make some custom rims for this project. Yeah, but its not rechargeable and it say its for a dorrbell etc or something that not uses a lot of Ah. You can get away with a really small pack, but eventually have to change it. A m-motor uses 850mah when stalled. A door bell uses like maximum 100mah when in use. I would go rechargeable whatever the case. Better for the environment too. Nice. Its printed and tested. Im very glad the someone inventet SLx printers or else your designs would not have any use. It didnt tag you. Would have been a bad advertisment. The one I made was worse, it didnt have the correct gear mesh. In mine models. Its about 0.1/0.2mm bigger at both holes and crosses, diameter diffrentiate between axle spinning and joint connector. Havent found the correct dim. When the joint fits tight. The spinning axle does not. @TechnicRCRacer I have a Wanhao i3 plus. Yeah, Ik wym about initial layer. I use fillet in fusion. About 1-2mm. Makes the elephant foot less elephanty and more like straight down and nothing like that stupid elephant. Glue makes my adhesion very perfect. Other use nothing or hair spray. I like glue for now. The models have to cool down a bit before I can remove them or else they're pretty much stuck. Some say its glued to the bed. How small do you want it? The smallest I can think of is 2L z20. Small vehicles dont actually need a diff. Bigger chance of failure when climbing over things. Oh, I thought you only had diff with the z36. I made these (post above) to see if the 8t bevel gears would work. They are pretty small, but work fine for now. Yeah. It will be fun to try yours. Have you ever done a diff like this? Dont know what is called, but its kinda different. It looks like those in rwd rc cars. This differential kinda worked, but wont handle any torque. i totally forgot the space between the crown and the pinion and have to make a pin for the planet gear instead of using a screw. Printed with layer height .1 and 10mm/s speed .4mm nozzle. I rather want quality than a fast and bad product. Efferman, hi. Do use Lego's own dimensions when making holes w/ or w/o crosses, and beams or have you done some testing to find something that works for you? I make Lego too, but I use FDM 3D printer. Works great even with really small gears. I had to test dimensions and have found something that works for me. 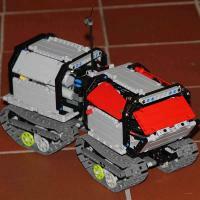 How to use a 540 motor with Lego Technic!